The earthquake that shook Japan with historic strength on Friday created a tsunami wave ten meters high. The water washed away boats, cars and houses in coastal areas north of Tokyo. It also led to tsunami warnings across the Pacific. Scientists recorded the magnitude of the earthquake at 8.9. The United States Geological Survey says it was the fifth largest earthquake since nineteen hundred. The largest, with a 9.5 magnitude, shook Chile in nineteen sixty. The quake struck near the east coast of Honshu, Japan's main island. It was centered under the sea about one hundred thirty kilometers east of Sendai. The tsunami washed away whole neighborhoods in Sendai. President Obama offered whatever assistance Japan needs. He had already planned to meet with reporters Friday, and began by talking about the disaster. BARACK OBAMA: "First and foremost, our thoughts and our prayers are with the people of Japan. This is a potentially catastrophic disaster and the images of destruction and flooding coming out of Japan are simply heartbreaking. Japanese media said the tsunami carried away a ship carrying one hundred people. Television images showed a whole community on fire. The quake has produced powerful aftershocks. It also raised concerns about possible effects on the world's third-largest economy. The economy was the second largest until China recently moved into that position. Japan was already struggling to rebuild economic growth and reduce its budget deficit and government debt. Japan has invested a lot of resources in preparing for earthquakes. Still, the nineteen ninety-five earthquake in Kobe caused an estimated one hundred billion dollars in damage. The value of the yen dropped Friday but then recovered. Japan is the world's third-largest importer of oil. World prices for oil fell after the quake. This followed weeks of increases because of unrest in the Middle East and North Africa. Oil traders said prices fell because of a belief that quake damage will hurt growth in Japan and reduce demand for energy. 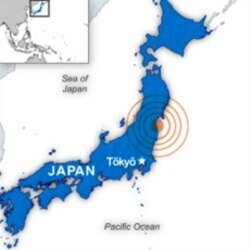 The quake happened about three hundred seventy kilometers northeast of Tokyo. It shook buildings in the capital, halting all train and subway traffic and leaving many people unable to get home. Joruji Shinozaki wrote on the VOA Learning English page on Facebook: Friday's earthquake was a nightmare. Suddenly the building where I live in Tokyo shook violently and objects began to fall. I was so scared because I've never experienced such a strong quake before in my life. Another Facebook user in Japan, Mitsutoshi Sato, wrote: It was a frightening experience. The blackout lasted for more than 10 hours around me. 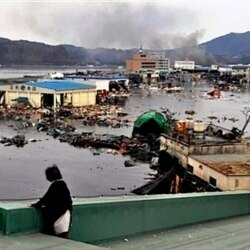 Thank each and every one of you in the world praying for Japan.